Samsung, in an effort to make the process of switching to new flagship Galaxy phones easier, announced Smart Switch application. This program allows you to shift from old phones to new Galaxy phones very easily. Also, it not only works for old Samsung phones rather it addresses almost every brand. Be it your very old BlackBerry or even your iPhone, the Smart Switch app is designed to work miraculously. Contacts, data, calendar events and media is easily synced through Smart Switch app. Read below to find download links for Samsung Smart Switch. If it wasn’t already quite helpful, the Samsung Smart Switch app also acts as an update tool. Smart Switch automatically detects which Samsung Galaxy device is connected and it finds out available updates for it. After download, the Smart Switch app can update your smartphone. As per the official description, “Samsung Smart Switch seamlessly transfers contacts, photos, music, videos, messages, notes, calendars and more to virtually any Samsung Galaxy device.” It really does! And for Samsung devices that are not compatible with Smart Switch, we have mentioned and linked to another Samsung utility below. Samsung Smart Switch is compatible with a range of popular smartphones that you can transfer data to and from. As mentioned earlier, highlight brands include BlackBerry and Apple’s iPhone. Rest any Android phone brand is ought to work. Once you install the Smart Switch program on your computer, it will automatically install USB drivers. This is especially helpful because you wont be fetching around to find USB driver packages around the internet. Samsung wants new customers who haven’t tried Android yet and it also wants to be the one providing users with their first Android smartphone. Hence, Smart Switch is designed to work with BlackBerry and iOS as these users haven’t tried Android or the Galaxy smartphone experience yet. Samsung Smart Switch app can be installed both on a Windows machine or a Macintosh. Gladly, both of these iterations have identical features and work efficiently. Samsung provides support for both Windows and macOS, download the package which applies to your setup. 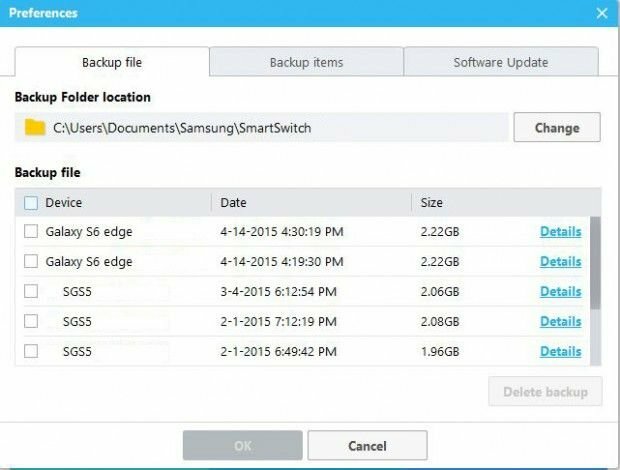 Samsung USB Drivers: Smart Switch software ships with newest USB drivers so you wont need an independent download file. If needed, you can grab the latest Samsung USB drivers here. Samsung KIES: If you would like to transfer content from your computer to your Samsung Galaxy phone, or vice versa, you can do so with another tool called KIES. This is for devices that are not compatible with Smart Switch. Get it from here: Download Samsung KIES.